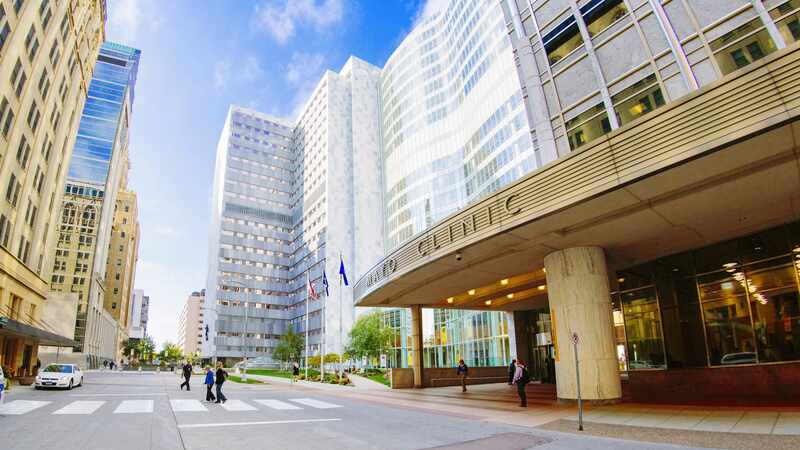 ROCHESTER, Minn. — With more than 1.3 million patients seeking Mayo Clinic’s expertise yearly, the institution continues its work to provide the best care to every patient through integrated clinical practice, education and research. Mayo Clinic reported a strong financial position in 2016, with contributions of $466 million to its pension plan for staff and more than $600 million in capital projects. In 2016, U.S. News & World Report named Mayo Clinic the best hospital in the nation, including No. 1 rankings in more specialties than any other hospital in the country; all eight Honor Roll specialties; and in Arizona, Florida, Minnesota, and the Phoenix and Jacksonville, Florida, metro areas. For more than 20 years, Mayo Clinic has led the way in U.S. News & World Report rankings, with more No. 1-ranked specialties than any other hospital in the nation. In addition to its destination centers and integrated community care model, Mayo Clinic Health System, Mayo continues to share knowledge and provide virtual consultations to providers through an international network of member practices, Mayo Clinic Care Network. With 10 new members in 2016, the network now has 45 members in the continental U.S., Mexico, Philippines, Puerto Rico, Singapore, and the United Arab Emirates. These independent organizations represent more than 120 hospitals. Through them, more than 12 million patients and their care teams have access to Mayo Clinic knowledge, clinical protocols and consultations through Mayo’s connected care platform. The Center for Connected Care continues to create and sustain digital connections with patients. Nearly 1 million people have Patient Online Services accounts. Nearly 75 percent of patients who have had an appointment at Mayo have accessed their online account within two weeks of that appointment. More than 1.1 million patient-initiated secure messages were sent in 2016. Nearly 10,000 patients were seen from appointments requested through the Mayo Clinic App. More than 20,000 discrete telemedicine consultations occurred across the institution, including eConsults, eVisits, eReviews and emergency or scheduled video telemedicine visits. Total research and education funding in 2016 was more than $1 billion ─ $523 million in Mayo Clinic funding and $482 million from external sources. In Minnesota, Mayo Clinic completed a near-total face transplant on a Wyoming man. The extensive, life-changing surgery performed by a multidisciplinary team of surgeons, physicians and other health professionals in summer 2016 will improve the patient’s ability to chew, swallow, speak, breathe and smell. The recipient, whose face was devastated by a gunshot wound at 21, is doing well. To serve as the national Precision Medicine Initiative All of Us Program biobank, Mayo received $142 million in National Institutes of Health funding over five years. The biobank, on the Minnesota and Florida campuses, will store and curate more than 35 million biospecimens from 1 million or more U.S. participants. The Precision Medicine Initiative aims to understand individual differences that contribute to health and disease. Research found that senescent cells – cells that no longer divide and accumulate with age – negatively impact health and shorten life span by as much as 35 percent in normal mice. The results demonstrate that clearing senescent cells delays tumor formation, preserves tissue and organ function, and extends life span without observed adverse effects. If the science is translatable to humans, a drug may be able to eliminate senescent cells and have profound effects on health and life span, researchers say. A treasure trove of data was made public from a study aimed at accelerating therapies for Alzheimer’s disease. The study details whole genome genotype and gene expression patterns on 2,655 individuals with and without dementia, and includes more than 842 million data points. Mayo Clinic invited other investigators to mine the molecular and clinical data sets. Mayo Clinic reported income from current activities of $475 million in 2016. These funds are committed to mission-advancing projects. Capital expenditures exceeded $600 million in 2016. These expenditures are part of a multiyear plan to continue to invest in an electronic health record and revenue cycle management integration project, and information technology infrastructure upgrades. State-of-the art facilities upgrades include Mayo Clinic Hospital – Rochester operating room expansion and bed tower projects. Strategic expansion in clinical areas includes a $100 million investment in major construction projects on Mayo Clinic’s Florida campus to provide integrated services for complex cancer, as well as neurologic and neurosurgical care. Construction began in summer 2016. Also on the Florida campus, construction began on a positron emission tomography (PET) radiochemistry facility. It will house a radiochemistry lab and cyclotron – a particle accelerator used in radiopharmaceutical production. The facility will produce Mayo-developed Choline C-11 for certain PET scans that “light up” prostate cancer and provide therapy targets, allowing for more effective treatment. At the Arizona campus, the new Proton Beam Therapy Program opened in March, delivering radiation therapy in a way that offers potential for fewer side effects and higher cure rates, often for patients whose cancers cannot be treated safely any other way. In 2016, Mayo Clinic contributed $6.7 million in cash and in-kind donations to local communities. Mayo provided $629.7 million in care to people in need. This total includes $83.3 million in charity care and $546.4 million in unpaid portions of Medicaid and other indigent care programs for people who are uninsured or underinsured. A nearly 2-million-square-foot life science research campus in downtown Rochester was announced in 2016. It will be the centerpiece of Discovery Square, 1 of 6 subdistricts in the Destination Medical Center (DMC) development district. Mayo will collaborate on the project with M.A. Mortenson Company, a Minneapolis-based and family-owned development and construction services firm. Discovery Square will serve as a point for physicians and scientists to come together with businesses and entrepreneurs to accelerate advancements in medical innovation and technology for critical advances in patient care. Construction is set to begin in the fourth quarter of 2017. Mayo Clinic continues its commitment to the DMC initiative, as evidenced by the $9.5 million invested in integrated operational support since the DMC plan was introduced. Mayo Clinic finished 2016 with $475 million in income from current activities – or net operating income – which translates to an operating margin of 4.3 percent. All of Mayo Clinic’s income is reinvested in its practice, research and education missions. Revenues grew by 6.6 percent to $11 billion. Benefactors, primarily grateful patients, contributed $296 million to fund Mayo Clinic programs in practice, research and education. Additionally, benefactors provided $216 million in future commitments, which will support Mayo’s mission in the years ahead. Mayo Clinic contributed $466 million into the staff pension plan in 2016 as a continued commitment to staff. Total research and education funding in 2016 was more than $1 billion ─ $523 million Mayo Clinic funding and $482 million from external sources. Mayo Clinic capital expenditures exceeded $600 million in 2016. These expenditures are part of a multiyear plan to continue to invest in state-of-the art equipment, facilities and technology including a new electronic health record and revenue cycle management system, network infrastructure and security upgrades. MEDIA CONTACT: Susan Barber Lindquist, Mayo Clinic Public Affairs, 507-284-5005, newsbureau@mayo.edu.